World Heart Day - how can we prevent cardiovascular disease? Today is World Heart Day – an important opportunity to put the spotlight on cardiovascular disease, which still remains the second highest cause of death in England. Many of these deaths are preventable, and today PHE has published a new and comprehensive document that highlights the ongoing impact of cardiovascular disease and provides an overview of our wide-ranging work on cardiovascular disease prevention. Action on cardiovascular disease: getting serious about prevention is intended for those involved in the commissioning and provision of services for cardiovascular disease and its prevention – including clinicians, local authorities, service commissioners, public health specialists and the third sector, as well as PHE staff. The document pulls together information on risk factors, key interventions and on the work being done locally and nationally to prevent cardiovascular disease at primary, secondary and tertiary level. It also outlines key priorities for action over the coming year. Analysing the breadth of our activity on CVD prevention has helped us to determine exactly what assets we have across PHE and how we can bring these together in a more integrated approach in order to maximise value and impact. We hope that many of the principles demonstrated here will be relevant to those working in local government and local services, and we are already seeing some great examples of joint working and best practice at local level. Crucially, the framework details the many tools and guides that PHE provides to support this vital work. It also brings us back to the importance of ‘getting serious about prevention now’- which is a key message of both the NHS Five Year Forward View and our publication ‘Evidence into Action’. We will continue to work with partners at a local and national level to improve the state of the population’s heart health, with a focus on preventative interventions. One of these interventions is the NHS Health Check which is offered to all people over 40 with no previous existing cardiovascular condition. The programme presents an invaluable opportunity for an individual to discuss their heart health with a professional, and learn about how to decrease their cardiovascular risk. Healthier You: NHS Diabetes Prevention Programme is also at the forefront of our aim to reduce the burden of CVD in this country, of which Type 2 diabetes is a large contributor. With the first wave of the programme now in full swing and set up to be offering referrals across nearly half (45%) of the country this Autumn, the programme is now beginning to take shape and start making a significant difference in diabetes prevention, which is so desperately needed to reverse the trend of increasing diabetes prevalence. Increasing the take up of the NHS Health Check, and consequently the Healthier You: NHS Diabetes Prevention Programme, is an integral part of our plan to reduce the burden of cardiovascular disease in years to come. To do this, we must make heart health information more accessible to at risk groups, which is why we have updated our Heart Age Tool. The tool was designed to help people find out how old their heart is and their risk of developing cardiovascular disease (CVD). New statistics published today in the BMJ Open have found that nearly 90% of men under 40 (87%) had a heart older than they were, compared to 41% of women of the same age. Of these, over a quarter (28%) had a heart age greater than their chronological age by at least five years. 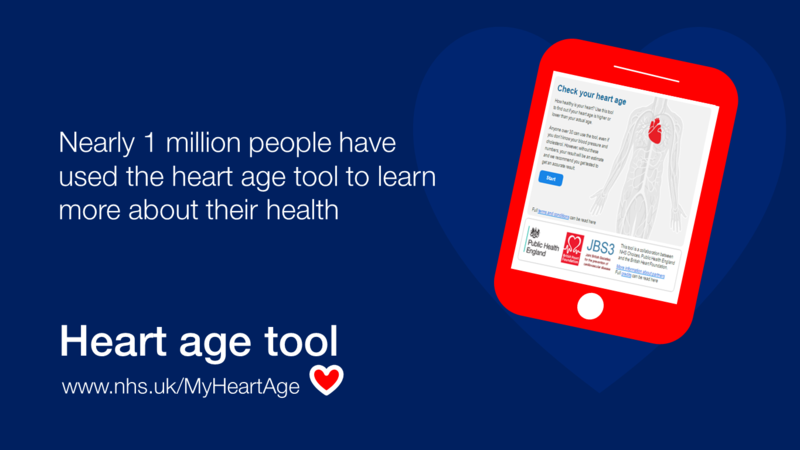 The new and updated version of the tool includes a more detailed user journey with added lifestyle indicators to calculate a person’s ‘heart age’. It also allows people to see how their heart age could decrease if they make certain changes to their lifestyle, such as losing weight. It is great news that almost a million people (960,000) have used the tool since it was launched. The older someone’s heart age is, the higher their risk of a cardiovascular event, such as a stroke or heart attack. A heart age greater than 70 increases the risk significantly. Even though symptoms may not be present, having a heart age higher than your chronological age indicates an increased risk of serious illness. 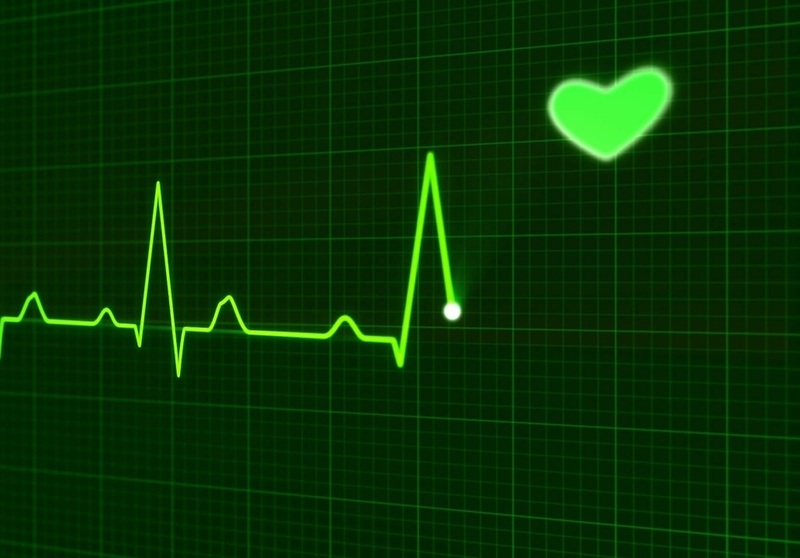 To ensure that we continue to make progress in reducing the number of deaths and years lost to ill health caused by cardiovascular – as well as the financial burden – we must do more to prevent these conditions and to support people to reduce their risk.